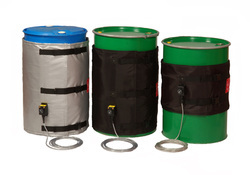 This unique product utilises a patented carbon rich semi-conducting flexible membrane to ensure temperature stability when heating steel or plastic drums in potentially explosive atmospheres. It is designed for ease of use as it can be fitted onto a drum by one person. Simply pull the straps and buckles tight when the heating jacket is in place and connect the integral five metre cable to a certified electrical connection. No transformers are required as it operates from standard ac supply voltages. 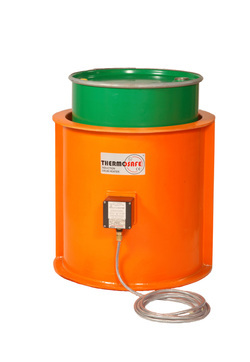 Inteliheat products are from the manufacturer of the THERMOSAFE® Induction Drum Heater. Unsurpassed for reliable, fast, efficient and safe heating of steel drums in harsh environments, IP66 rated, and including ATEX/IECEx certification as standard. The original "Type A" Thermosafe unit is well established and proven in applications around the world for steel drum heating. It is ATEX and IECEx certified to International Standards in all configurations, but due to its energy efficiency, reliability and speed of heating it is frequently used in general industrial applications. 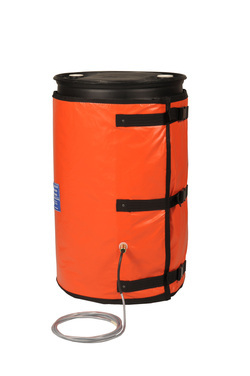 Its IP66 (hose-down) rating makes it particularly suitable for harsh environments, and as there are no moving parts it is the most reliable drum heater available. There are many heaters that have been in active and continuous service for over 25 years! The "Type B" Thermosafe unit was introduced for applications where similar power is required but the voltage supply available is 110 or 120v ac. When difficult solids need to be melted from steel drums in potentially explosive atmospheres our "FARATHERM" Induction Base Heater can be added to the system to further speed the melt time, or where it is desirable for liquids to be heated as fast as possible for other process reasons. A rigid "top-hat" is available for certified areas to create a mini-oven and/or to boost the top temperature achieved. In safe areas, our insulated soft top may be used. If you do not require ATEX certification, consider one of our standard flexible heating jackets.